Daniel T. Janis, Esq. practices in the Business Law area at – Davis, Malm & D’Agostine, P.C. His practice focuses on mergers and acquisitions and representation of public and private companies in a range of general and transactional matters, including corporate finance, private equity placements, venture capital financings, syndicated commercial credit facilities, joint ventures and day-to-day business counseling in a variety of industries. Before becoming an attorney, Dan was a Peace Corps volunteer in Mali, West Africa, and a musician. He can be reached at djanis@davismalm.com. It’s an exciting time when a VC comes onto the scene. Founders work hard to find financing. When big money and an attractive valuation are proposed, it’s hard not to get caught up in the moment. But financing always comes with strings attached. Be aware. Read the shareholder agreement! “Investor Rights Agreement,” “Right-of First Refusal and Co-Sale Agreement,” the simple “Side Letter” are all different varieties of shareholder agreements. 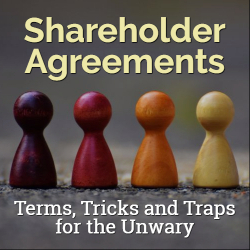 Whatever the shape and size, a shareholder agreement can contain a broad variety of potential tricks and traps. VCs want to know who they are getting in bed with (who wouldn’t!) and be sure that company ownership cannot substantially change without their consent. Founders and other key shareholders almost always have to accept some restrictions on transfer. The questions are, how tight are the restrictions and to whom do they apply? Carve-outs permitting transfers to trusts and estate-planning vehicles are common and, if important to a founder, should be demanded. Who should be restricted is complicated, and sometimes contentious. There is an inherent tension between founders and the company (who collectively want tight control in anticipation of a financing) and common shareholders who are not founders, but may hold some substantial portion of shares (who often feel like they should not be subject to transfer restrictions). Not anticipating these dynamics in advance of a financing may easily result in giving inadvertent leverage to individual shareholders at the very moment when having a united front is most important. Hey Man, We’re Trying to Run a Business Here! VCs always require some level of control over the company, even when they hold less than a majority of shares. Control comes in the form of the right to appoint board members and the right to veto certain specified actions. The balance to be struck in the shareholder agreement is for the VC to have enough control to protect its investment while not stifling the company’s agility in an ever-changing business environment. When founders and VCs see eye-to-eye (typically at the moment of funding), everything is great. But when visions start to diverge (usually when business is not growing as planned) the specific wording in the dusty, long-forgotten shareholder agreement becomes front and center. Founders should negotiate these provisions with the worst case scenario in mind, and be confident that they could effectively run the business if the VC exercised every veto right possible, and the VC director opposed every suggested initiative. Drag-along rights allow a VC to force other shareholders to sell their stock when the VC finds a buyer. The critical component of a drag-along right is the threshold price above which a shareholder must sell. While the interests of shareholders of all classes are usually aligned when the sale price is high, interests start to diverge when the sale price is lower (when it becomes more likely that, after paying the preference on the VC’s preferred shares, little or nothing will be left over for the common shareholders). Here again, founders need to assume a gloomy scenario when agreeing to terms. Nobody reads a shareholder agreement during a blockbuster sale. But they revisit every page when the deal is not so good. There is more to a VC investment than money and valuation! Shareholder agreements give VCs extensive rights, far beyond the economics reflected in a company’s charter. Reading the fine print, and understanding the nuances and dynamics is critical. Read the shareholder agreement slowly. Read it to the end. Then read it again. And negotiate hard. If everything goes well, you’ll never read it again. And if not, you’ll be glad you did.